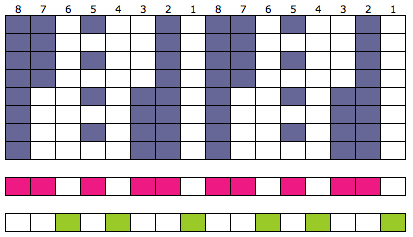 Since it is seven stitches wide, if punched accordingly it would occupy 21 out of 24 stitch units on a punchcard, so as is (unless those extra needles on the far right and left are left out of work for ladders) it would not be suitable for an all over fabric. It can however, be used for a trim. 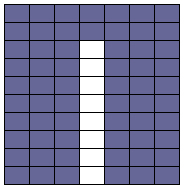 If the latter is the intent, only one series of vertical repeats as seen below needs to be punched. 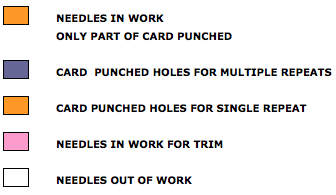 The numbers below the image indicate Brother needle tape markings. This is a 6 row tuck fabric, so thinner yarns should be used if the pattern is automated, as tuck loops build up in needle hooks. 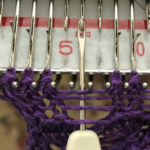 If you wish to experiment with slightly thicker yarns, decrease the unpunched areas to 4 rows, or execute using holding. Held stitches sit on top of the needle shank, tolerance is determined by how many rows it either takes for knit stitches on sides of the loops jumping off needles, or accumulated loops being unable to knit off consistently on the next all knit pass. 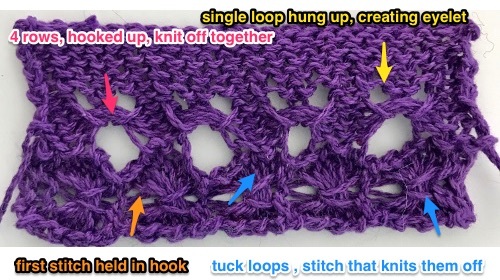 To test yarn out, try the technique by using holding, then punch your card. Automating makes the process less prone to error and faster if great lengths of a trim are needed. 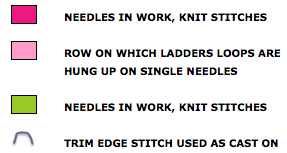 Single bed: arrange the needles as shown. 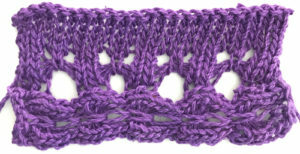 Cast on and knit a few rows, set knob to KCII, knit one row. Push in both tuck buttons, and knit desired number of rows. Double bed: OOW needles on main bed will now be in use on the ribber Set half pitch lever on H, racking indicator on 5. Cast on desired number of stitches, knit base rows. 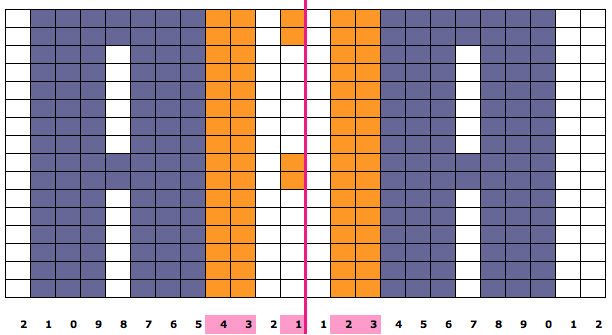 Set half pitch lever on P, transfer stitches between beds arranging them as shown with NOOW on both beds. Set change knob to KCII, knit one row. Push in both tuck buttons, knit in pattern for desired number of rows.